When two metallic surfaces under direct contact move over each other, they create friction which generates heat. This causes excessive wear and tear of those moving parts. However, when a film of lubricating matter separates them from each other, they do not come in physical contact with each other. Thus, lubrication is a process that separates the moving parts by supplying a flow of a lubricating substance between them. The lubricant could be liquid, gas or solid. 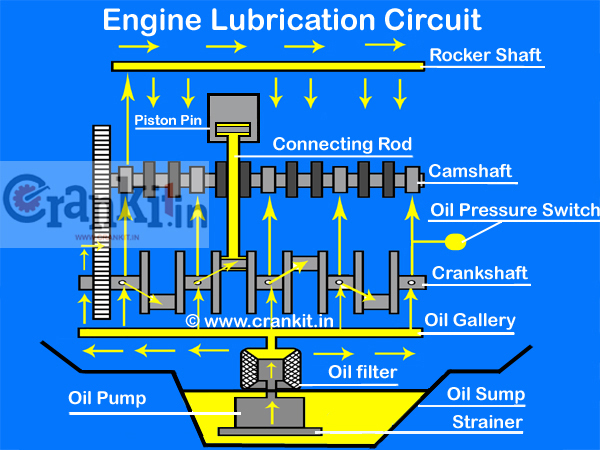 However, engine lubrication system mainly uses liquid lubricants. Minimizes power loss by reducing the friction between the moving parts. Reduces the wear and tear of the moving parts. Provides cooling effect to the hot engine parts. Provides cushioning effect against vibrations caused by the engine. Carries out the internal cleaning of the engine. Helps piston rings to seal against high-pressure gases in the cylinder. An Oil Pan / Sump is just a bowl-shaped reservoir. It stores the engine oil and then circulates it within the engine. Oil sump sits below the crankcase and stores the engine oil when the engine is not running. It is located at the bottom of the engine in order to collect and store the engine oil. The oil returns to the sump by pressure/gravity when the engine is not in use. Bad road conditions could cause damage to the Oil Pan / Sump. So, the manufacturers provide a stone guard/sump guard underneath the sump. The sump guard absorbs the hit from the uneven road and protects the sump from any damage. An Oil Pump is a device which helps to circulate the lubricant oil to all the moving parts inside the engine. These parts include crankshaft & camshaft bearings as well as valve lifters. It is generally located at the bottom of the crankcase, close to the oil sump. The oil pump supplies the oil to oil filter which filters and sends it onward. The oil then reaches different moving parts of the engine through oil galleries. Even, small particles can choke the oil pump and galleries. If oil Pump gets blocked, then it can cause the severe damage to the engine or even complete seizure of the engine. To avoid it, the oil pump consists of a strainer and a by-pass valve. Hence, it is necessary to change the engine oil and filter at regular intervals as recommended by the manufacturers. In order to get better performance and longer engine life, it is essential that the engine oil quickly reaches the moving parts of the engine. For this purpose, manufacturers provide oil galleries within the engine. The Oil Galleries are nothing but series of interconnected passages which supply the oil to the remotest parts of the engine. Oil galleries consist of big and small passages drilled inside the cylinder block. The bigger passages connect to the smaller passages and supply the engine oil upto the cylinder head and overhead camshafts. The oil galleries also supply the oil to the crankshaft, crankshaft bearings and camshaft bearings thru holes drilled in them as well as to valve lifters/tappets. 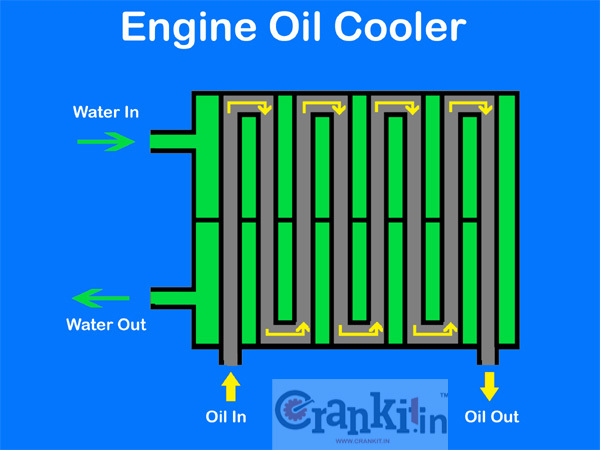 The Oil Cooler is a device which works just like a radiator. It cools down the engine oil which becomes very hot. Oil cooler transfers the heat from the engine oil to the engine coolant through its fins. Initially, manufacturers used the oil cooler only in the racing/high-performance vehicles. However today, most vehicles use oil cooler system for better engine performance. Oil cooler which helps to maintain the engine oil temperature also keeps its viscosity under control. Additionally, It retains the lubricant quality, prevents the engine from overheating and thereby saving it from wear and tear. What is Bank Angle Sensor in motorcycles? How A Car Air Conditioner OR Car A/C Works? How Bosch Mechatronic front wiper system works? OHC vs SOHC vs DOHC: What Is The Difference Between These Technologies?